Up there, within our own Solar system (and beyond) everything is in motion. There is no space object that is standing still. Ever since the big bang. Even the black holes that are capturing things into singularity point are moving across the universe along with their own neighborhood. The same is with Earth and its first neighbor Mars. They are both orbiting the Sun in their own time schedule - Earth needs full year to complete the cycle, while Mars in its own distant orbit needs 322 more days to do it. While both, Earth and Mars travel around the Sun, sometimes they got closer to each other by the approximate 55 million kilometers (while the farthest distance between the two is about 400 million kilometers). Of course, we can't launch directly toward Mars when it is at closest distance, otherwise the rocket will need lots of fuel and speed for a chase race with a running planet. However, more or less, every 26 months, Earth and Mars provide a launch window opportunity for a modestly fueled spacecraft, by using Sun's gravity boost, to intercept the red planet in about 200 days or so. 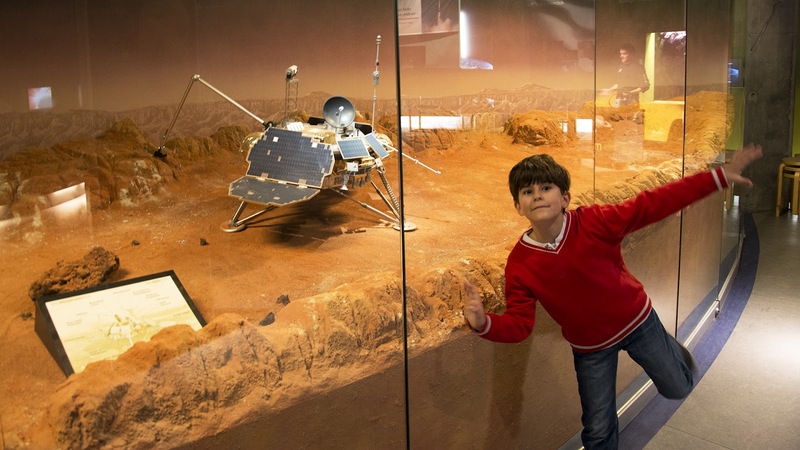 Ever since 1971 and first attempt to land on Mars by Soviet Union, until now the red planet are counting 12 citizens in wide variety of robotic probes, rovers and automatic laboratories. Most of them are now dead, either by problems with descent stage or after they operated a decent number of Martian days or sols to be exact. However, on this day, two of the recent ones are still alive and very much well doing science every sol or when they receive a job from their headquarters. This is a story about them. True Martians. The only ones. Well, maybe there are other living organisms on Mars still waiting to be found or perhaps there are at least some evidence of former life in the past. but lets face it - in lack of significant global magnetic field, that is the only known natural shield from deadly solar and all other dangerous radiation from the heavens, living organisms like we know have no chance to survive. On the surface that is. And probably below the first layers of the Martian ground. So, unless there are no Zions, deep underground, with friendly and scientifically superior little green men, we can safely say that our robotic endeavors are the only Martians in existence. Extremophiles don't count. Nor the fossils. Not that we found any so far. So let's meet our own Martians in chronological order. During the 60ies and early 70ies, former Soviet Union maintained large Mars exploration, with dozen of flyby probes, landers and orbiters, launched toward Mars, along with Phobos program to study its two moons, Phobos and Deimos. Mars 2 and Mars 3 landers were identical twins, launched in May 1971, more than one ton weight with included small ski based rover named PROP-M, which was not rover per se, but instead an attached movable scientific instrument designed to study soil composition attached to main lander. Unfortunately, "Mars 2", crashed on surface during descent, due to the technical malfunction, but "Mars 3" had better luck, at least when it comes to descent - it manages to perform soft landing perfectly well, but only 20 seconds after it started basic operation, instruments stopped working for good, perhaps as a result of the massive surface dust storm, lander had to go through during descent stage. Both small rovers never got the chance to do any science, but if they did, along with the mother lander, attached scientific instruments were equipped to study atmosphere composition as well as mechanical and chemical properties of the surface, including a search for organic materials. State of the art of the time, 360 degrees view television cameras were mount to take first ever photos from the planet surface. Even more disastrous fate hit flyby spacecraft "Mars 6" and "Mars 7" and their landers two years later. With significantly smaller cargo in size and weight and without rovers on board, "Mars 7" prematurely deployed it's lander and miss the red planet entirely, while "Mars 6" managed to descent all the way down but unfortunately it lost connection just before soft landing. As it seems, 635kg lander was rocking and swinging too heavily under the parachute or it had insufficient thrust during landing and finally crashed on surface. However, it was the first time that any lander in Mars exploration history recorded all stages during the descent until the very end. The very next launching window, after Mars 6 and 7 twins, was taken by one of the major historical success with our "fight" with red planet. In August and September 1975, another twins are sent to Mars, within Viking program, operated by NASA. Contrary to previous Soviet missions, Viking orbiters didn't fire landers before establishing stable orbit around Mars or before flyby. This provided better planning of choosing the landing sites by analyzing orbiter's images of Mars surface. After safest landing places are chosen, both landers detached and performed perfect descends. The only "glitch" in this phase was the rocky terrain below Viking 2, causing lander to stay tilted at 8.2 degrees with one leg on a rock. Combined, both landers stayed operational for more than 3500 Martians sols (one sol is longer than a day by 39 minutes and 35 seconds) thanks to two radioisotope thermoelectric generators with plutonium-238 as a fuel. Not only that they returned to Earth ton of color images and data related to Mars weather, atmosphere and soil condition as well as seismological and magnetic properties of the landing area but as a crown jewel of landers scientific research, Vikings were equipped with four scientific tools to carry out biological experiments in search for Martian life or at least proof of existence of organic materials. To say the least, results of biological experiments provided scientific debate among scholars for years. In short, one biological test called Labeled Release, successfully proved that Martian soil is able to metabolize test samples, which is something that is made by microorganisms on Earth. However, not a single organic molecule was found in the soil by other three tests. In conclusion, either microorganisms exist on Mars but somehow weren't detected by three independent experiment, or metabolism can be performed by non-organic materials in highly oxidizing soil. On the other side, aside biological experiments, if you ask me, two interesting facts related to the program is Carl Sagan's involvement with the Viking team by searching and choosing potential landing areas on Mars and the other one is successful test of general relativity. On November 25, 1976, Mars location was perfectly positioned behind the Sun, and landers were instructed to return radio signals sent from Earth. The time of the round trip was measured and confirmed the "Shapiro time delay effect", which states that radar signals passing near a massive object, like in this case the Sun, take slightly longer to travel to a target and back than they would if the mass were not present. Twenty years after Vikings, no lander was designed to travel toward red planet. In the meantime, technology matured enough to provide cheaper development of scientific tools, spacecrafts and rovers, especially when it comes to communications with different orbiters launched toward Mars in the meantime as well as with advances in information technology and scientific tools. 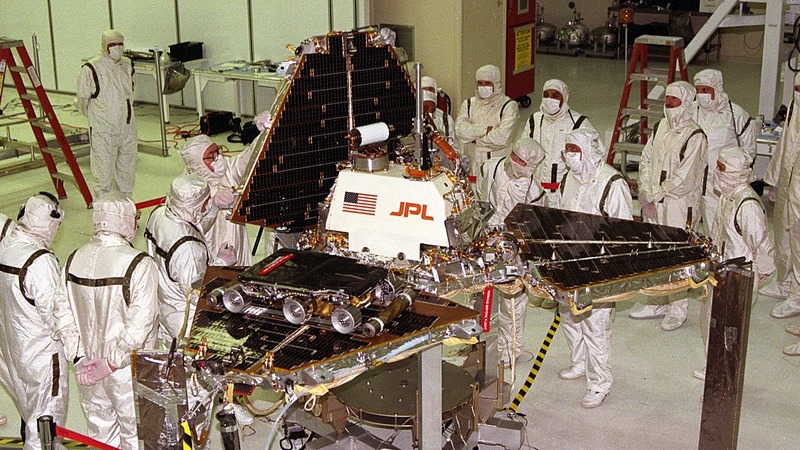 The next lander that was launched in December 1996, was NASA's "Jet Propulsion Laboratory" project "Mars Pathfinder" with its own small rover named "Sojourner", The mission itself was more a Proof-Of-Concept of grown technologies used for future exploration comparing to acquired scientific data. Perhaps the major innovation during descent was using large airbags to cushion the impact. After aeroshell аnd parachute did their jobs to slow the descent to 68m/s and after lander was deployed from the backshell down by use of sort of tether and after retrorockets mounted on the backshell did their job to slow down descent to 0m/s, inflated airbags that completely surrounded the lander cut loose and fall on the surface bouncing for more than dozen times with first bounce being about 15m high. Amazing. I remember back in 1997 when I watched all animations of whole descent, I wished I was Martian and saw all this in real time. Anyway, once the lander stopped rolling, airbag deflated and retracted and Pathfinder's petals, just like with flowers, opened to allow the lander its three months of operations. 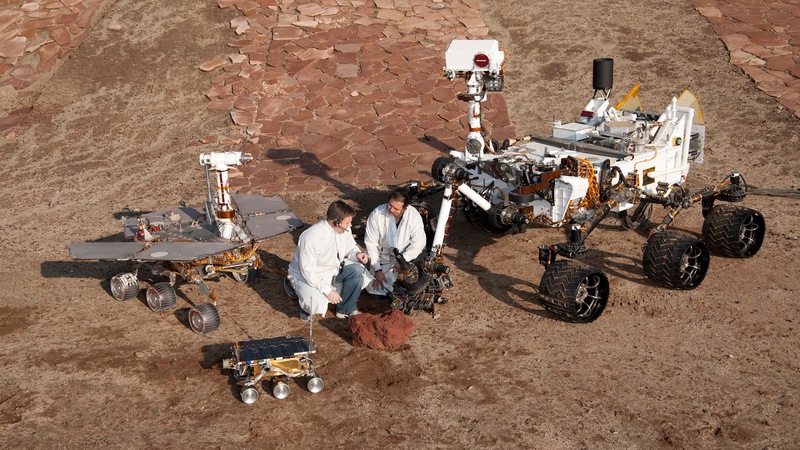 Second POC in the Pathfinder project was real wheeled rover, that was engaged near the lander and examined about couple of hundreds of square meters and performed chemical analyses at sixteen different locations. For the first time it was used semi-automatic navigation with automated obstacle avoidance. 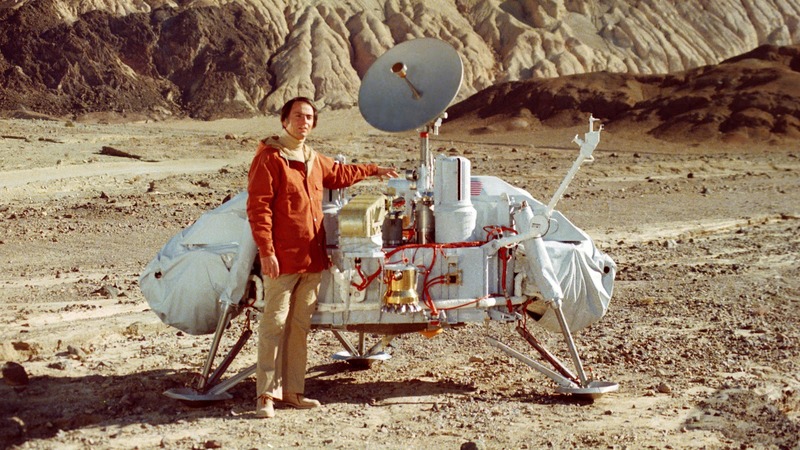 After mission closure, the name of the project is renamed to "Carl Sagan Memorial Station" for his contribution to the World of Science and especially for his engagements with Mars exploration. I think I still have a science magazine from the time with beautiful photos took by the lander of the small rover doing some science with X-ray spectrometer on the "Yogi Rock". In a way this lander was a milestone for next lander missions and it was recorded not only by scientific circles, but also in Hollywood productions. I remember a pretty good Sci-Fi film called "Red Planet", starring Val Kilmer, premiered in November 2000, being an homage for the NASA's Discovery Program, with Mars Pathfinder as its second project. Not only that they used inflatable airbags for the descent to the surface from the orbiting spaceship but Sojourner helped estranged astronauts to make a radio contact with the orbiter. In our chronological order, after Pathfinder's successful mission, two landers launched in the dawn of the 21st century, experienced misfortune similar to those Russian probes from seventies. 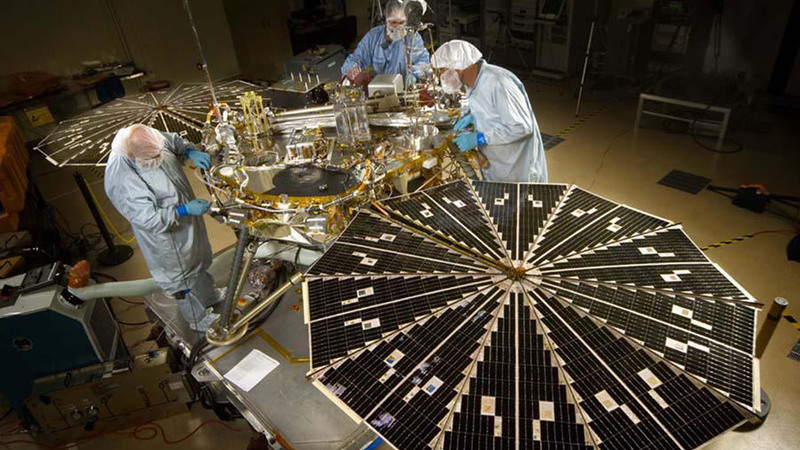 First one called "Mars Polar Lander", from the title image above, came to Mars in December 1999, designated to land near the south pole on Mars and to study the soil and climate of "Planum Australe" plain. During the descent phase MPL supposed to fire two "ballistic" probes named "Deep Space 2" and to study soil from the impact craters. However, the lander prematurely stopped engine and in result lander fell down with high velocity and failed to made soft touch down. No communication was made with either lander or two impact probes ever since. This was the only mission targeting south pole so far and potentially retrieved meteorological conditions of the area, analyzed samples of polar deposits would gave us lot's of data to compare with other regions. Sadly, if we exclude latest three rovers which are located not too far south from Mars equator, all other Mars missions designated to land deep into southern hemisphere failed or crashed during descent. 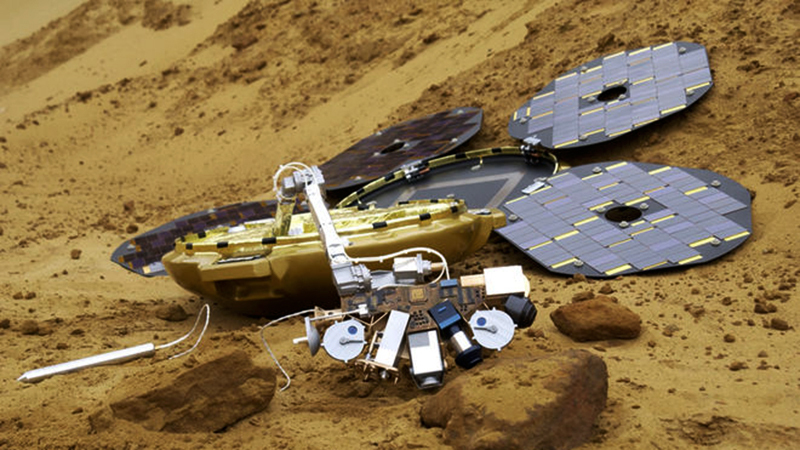 Exactly four years later, in December 2003, ESA's "Mars Expres" orbiter launched small British lander called "Beagle 2". Small lander never called back and for 12 years nobody knew its fate. Finally this January, NASA's "Mars Reconnaissance Orbiter" with its HiRISE camera, took a photo of "Beagle 2" completely intact on the surface just where it was expected to land. Unfortunately, one of the petals, didn't open properly and deployment of its radio antenna failed to take position. Contrary to most others Mars lander missions, "Beagle 2" is not created and funded by any of space agencies. Instead it was the academic project of Milton Keynes "Open University" and University of Leicester headed by Professor Colin Pillinger. Perhaps the most famous Martians, considering all robotic missions so far, was Mars Exploration Rover twins, "Spirit" and "Opportunity". 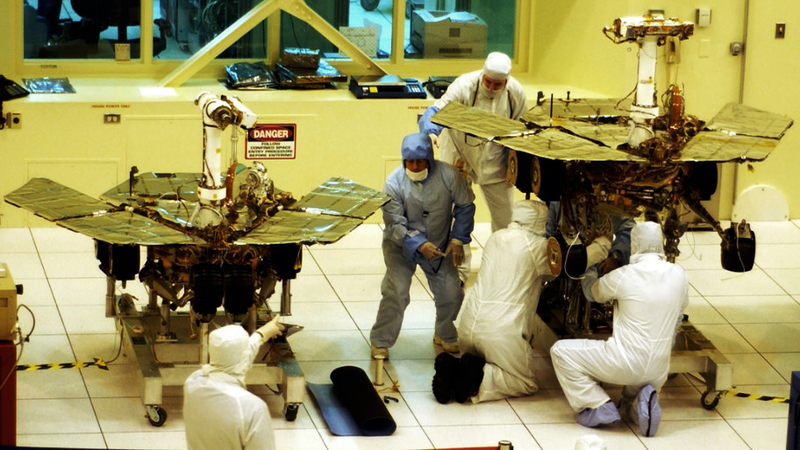 Following the successful technology used in MPF/Sojourner project, significantly larger rovers are designed in JPL and in January 2004, both airbags, carried cocoon type of lander's, bounced and rolled safely to their designated landing sites. It was especially interesting Opportunity's stopping point - airbags stopped into ultra small, only 22 meters wide crater, now named "Eagle crater" which served as a hole in one giant, inter-planetary golf game with a 7 months long shot. I remember, I regretted when they named the crater - much better name was "19th hole". Spirit landed in Gusev crater on the opposite side of Mars and staid operational until March 2010. MERs were, sorry, are ("Opportunity" is still alive and keep doing science ever since), fully solar-powered, six-wheeled, rovers with Sojourner's "rocker-bogie" modified mobility system and lots of scientific tools and instruments. Spirit passed 7.73 km, "climbed" to three hills and even though it lost one of its front wheels, until it got stuck in soft soil and stopped all operations due to power problems, scientific data retrieved from analyzed rocks hinted that they were altered by water flow in the past. Some of the minerals found are thought that can only be formed in the water. More water-friendly areas, at the other side of planet, where Opportunity is still rolling and doing geology, showed definite proof of ancient wet environments with, probably most important discovery of near-neutral-acidity clay deposits formed in presence of water. Furthermore, evidence support theory that in distant past water on Mars wasn't permanently present and then evaporated. Instead Opportunity detected multiple floods and dry periods happening in Endurance crater where "Oppy" spent almost half an year in its now two-digits life span on red planet. Especially interesting was rover's visit to the western rim of the crater and a small hill located there called "Matijevic hill". Rocks explored there are estimated to be the oldest rocks it has ever studied on Mars. There were layered, fine-grained formations and date from Mars' Noachian period, which is more or less up to 4 billions years old. Other, younger rocks indicates that they formed or altered in presence of highly acid waters which means that older Mars had bigger chances to provide life-sustainable environment as we know it. Four years later, in May 2008, another lander joined MER twins. This time, robotic lander named "Phoenix", part of "Mars Scout Program", handled by several agencies and university laboratories from multiple countries and companies, took the best launch window, that occurred in August 2007 in order to send a rover to the northernmost area of the red planet possible. Just like our blue planet, the red one is tilted by 25 degrees, providing unique weather properties on its poles. When Phoenix arrived, in late spring, the Sun was on the sky all day long and lander didn't experience sunset before September 2008. It was pretty handy, considering extremely low temperatures so far north and the fact that the only power was coming from solar panels. On the dark side of the medal, planet's tilt also provides seasons and eventually, when winter came it was also the end of the Phoenix life as it was projected for work only during summertime. Wintertime temperatures can go dip down to a frigid -150° C. However, during 155 sols of operation, Phoenix confirmed previous findings by NASA's Mars Odyssey orbiter from 2002 that the northern region on Mars contains water ice mixed with the soil just below the surface. By using "Thermal and Evolved Gas Analyzer", samples are heated to 0° C and water vapor was detected. Another great find was perchlorate (ClO4) - which not only that some bacteria on Earth use for food, but it is possible to use it as a rocket fuel and for a source for oxygen for future human missions to Mars. Finally, "Curiosity", the latest, to date, rover on Mars, arrived on Mars in August 2012, within the southern equatorial area. 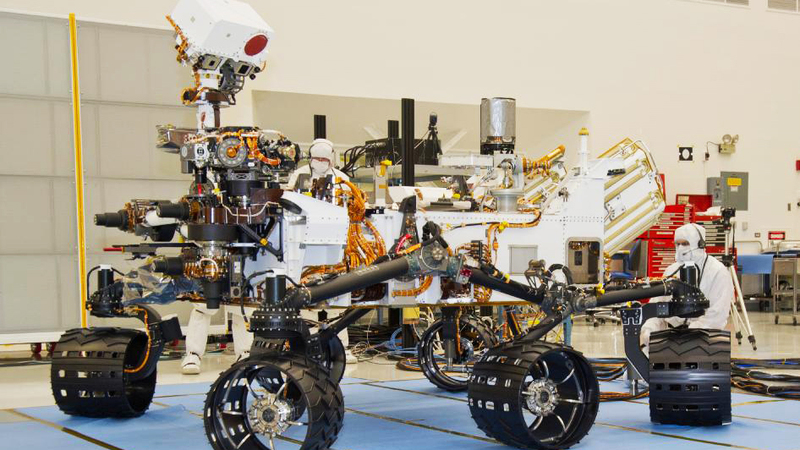 Like its predecessors, Curiosity is also six-wheeled "rocker-bogie " rover, powered by radioisotope thermoelectric generators and it as big and heavy as a small suv car. For the first time in short history of Mars surface exploration, robotic lander managed to descent to the previously selected landing site, just couple of kilometers northeast from the selected bulls-eye spot. This was provided by new steering technology by using thrusters and ejectable balance masses. Also, for the first time, mission to Mars received a goals and objectives that we might consider true research and a base for future Mars missions. Of course, I am not trying to minimize all the achievements from previous landers and rovers - they actually gave us lots of scientific data about the planet climate, atmosphere and soil composition, local weather and evidence of previous conditions on Mars. However, for the first time, Curiosity received a task to investigate exploration area in respect of Mars' habitability and collecting data for a future manned mission. "Gale" crater more than 3 billion years old, where Curiosity landed, was chosen with keeping in mind that future astronauts could spend the most time in the future within similar environment - equator is the hottest place on Mars and the area is rich with minerals that might provide further evidence of early wet periods on Mars and possible findings of micro fossils due to detected presence of chloride minerals that are very useful in preservation of fossils on Earth. Landing in crater by its nature is preferable due to the fact that large object that created it in the first place is one of those natural drill mechanism and digging in the crater's floor is like investigating deep below surface and provides a chance for exploring rocks and soil samples that would be impossible to find on the surface without a serious drill. Curiosity is doing science as we speak, for more than 2 years now and it is estimated that it will last many more, but even so far, it returned several promising findings. Among the most important ones is the measurement on the ground level of radiation. Regarding protective magnetic radiation shield, Mars is considered a dead planet - it has no magnetic field capable to defend the planet and radiation from space, mostly meaning solar winds are easily penetrating weak atmosphere. I read once that future terraforming of Mars should include igniting it's core or magnetizing it with some polar super magnets. But, until then, if even possible to do it with some futuristic technology, Curiosity found that radiation on Mars is not as dangerous as we might think of - its comparable to the IIS environment. That's a good news - it's not that future Mars colonists will be free to walk shirtless on Mars, but still, it will be manageable. Experiments on board the rover also confirmed Opportunity findings that water was flowing on Mars. More water on Mars in the past, means, more habitable it was. Perhaps, even stronger magnetic shielding existed as many scientist believe that solar wind is the one to blame for Mars' desert shape today. Moreover, analysis of some minerals, hints that area where Curiosity is roving right now, based on pH neutrality and presence of sulfur, nitrogen, hydrogen, oxygen, phosphorus and carbon found in drilled rocks suggest that once before was truly habitable. These were all twelve lander missions in past 44 years. If you look at them from this distance, it is obvious that Mars surface exploration is maturing and scientifically speaking growing and following technology progress over the years. We now know great deal about our first neighbor but there is still a lot to learn though and we will continue as soon as next launching window arrive. And that is next year, when toward Mars is preparing Phoenix successor called "InSight". when we will hope to have our first 5m hole dug on Mars. Perhaps, following years will add more "insights" of Mars interior and with "self-hammering nail" tool on board, new precise seismometer along with further measurements of planetary rotation maybe we will know more about Mars's core. Interesting time ahead.